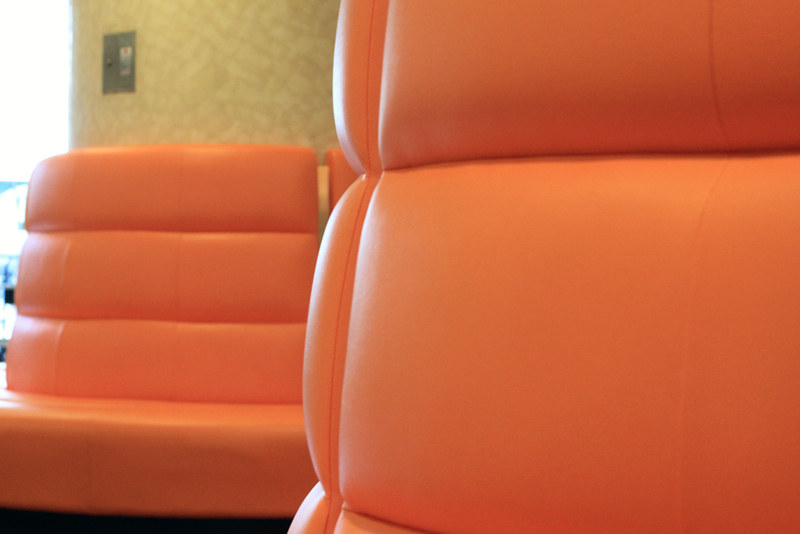 I am back on the Space Age meets baroque orange PVC seat in the hotel lobby. The floor is comprised of polished marble tiles, the predominant design of which contains different-sized irregular sections spanning the colour spectrum of brown, from the lightest beige to the darkest tan. These brown squares are interrupted by arrangements of squares of green, white and red and there is a large circular composition immediately in front of the three lifts. At the front of the lobby, natural light that floods in through the polished doorways provides the majority of the illumination with recessed spots in the ceiling helping out. Deeper into the ground floor, in the seating areas where we have breakfast and tea, many more spots brighten the atmosphere, becoming shrillest near the servery, where reflective glass multiplies the effect. Four large blue screens confront you when you enter the hotel. 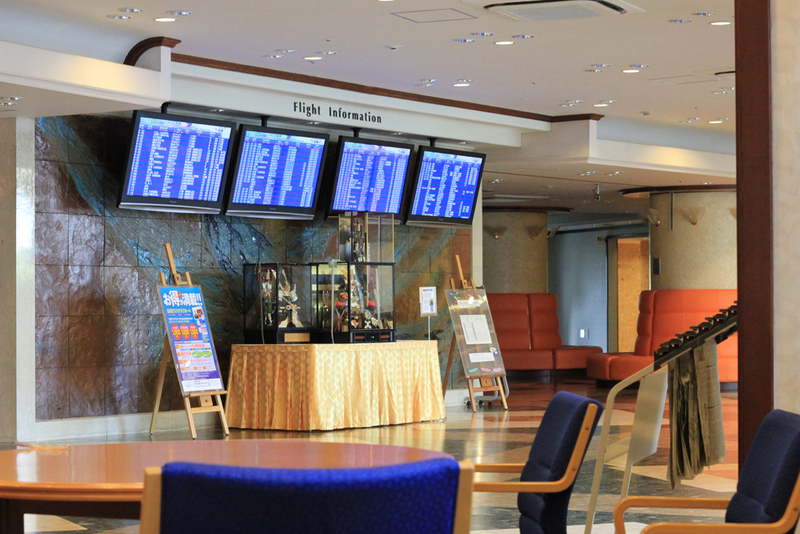 These display scrolling information about flight arrivals and departures: Cairns, Fuzhou, Hanoi, Guangzhou, Guam, Washington DC, Seattle, Tashkent, Amsterdam, Ulan Bator, Shanghai, New York City, Hiroshima, Ho Chi Minh City, Sendai, Bangkok, Fukuoka, Busan, Dallas Ft. Worth, Munich, Zurich, Port Moresby, Moscow, Beijing, Khabarovsk, Dubai, Dalian, Taipei, Seoul, Vienna, Nagoya, Kuching, Rome-Fiumicino and Gold Coast are all getting ready to fly as I type this. And what can I hear? Perhaps the principal contributor to the soundscape derives from the piped muzak. This changes throughout the day, taking on different tonal colour and different pace according to the waking hour. Something soft and soothing in the dawn time, a little more energetic as the hour of the dog turns to the hour of the wolf. And yet these differences are only fine gradations on a palette that leans towards the neutral, the aural equivalent – perhaps – of all those browns laid out in the fundamental marble tile from which the lobby’s floor is constructed. To someone with a better musical knowledge than me, I suspect the tunes would all be readily identifiable. They seem drawn from a Western repertoire that has – in this form at least – little to offend in its restrained piano keys, controlled guitar strums, moderately breathed wind instruments, muted sweeps of strings. The flute – synthetic or real, I can’t tell – appears to be something those responsible chose to keep in their back pockets, ready to be drawn out and deployed at the slightest melodic notice. None of this should grate – indeed it is presumably designed not to – and yet it sets my teeth on edge and I find myself involuntarily ducking as a new work descends from the speakers hidden in the ceiling above. It is many decibels distant from the grinding rancour of the taxiing noise and offers a much more glossy acoustic envelope that the rough textures that radiate outwards from the runways. Yet I still experience this elevator music – and yes, it seeps into the confines of the lift as you descend from floor to floor – as something that exerts an unpleasant pressure on me as a listener (a more unctuous pressure, a less harsh one, but still a pressure). Elsewhere in the lobby, other sounds rise up. Coughs and sneezes, footfalls (each betraying specific choices of shoe), murmured conversation, greetings from the staff to the guests (of customary importance in Japan), the trundle of luggage and the report of a bag dropped down by a weary traveller, the occasional peal of laughter. The infra-red activated doors wheeze open and shut, the lift doors part and join, accompanied by a ring and a canned announcement, the dryers churn in the Coin-Op laundry, occasionally a printer gets going in the Business Suite, the ice dispenser rattles and the bright-lit vending machines manage an equally bright acoustic of inserted coins and descending metal cans of juice and beer. And the job of running the hotel is laid out in sound, hoovers, cutlery being sorted (and chopsticks, too, giving a local slant on this supposed non-place), the buses’ hydraulic brakes hissing, tables being polished, broadsheet newspapers folded and returned to their shelves. One interesting sound relates to the woven net of plastic that is strung with small spherical silver bells that cover passengers’ luggage when it is left in the foyer. It is too early in the year for the air-conditioning to have kicked in but this will doubltess at its own frequencies to the hubbub when things hot up. The one thing that it is very hard for my ears to discern in the lobby is any noise from the airport, only a few hundred metres to the west. From my room, I can hear a lot of the airport but in the entrance to the hotel I cannot.